If you have small hands it can be tricky to play guitar the way you want to on a “standard sized” guitar. Now what constitutes a standard sized guitar is up for debate but the important thing is that there are some useful guitar tips for small hands players that will help you to play the guitar as well as if you had long fingers. Try to find a guitar with a shorter scale length. The scale length of a guitar is measured by multiplying the distance between the 1st fret and 12th fret by 2. How this length is determined is unimportant though. The important thing here is that you if the scale length is shorter then the distance between the 1st and 12th fret is shorter. This essentially means that the frets are closer together which makes it easier for smaller fingers to stretch between the frets – this makes it easier for every aspect of playing, particularly for playing chords. What Scale Length Should You Look for? A full-length scale length is usually around 25.5mm (648mm) give or take depending on the guitar and the brand. Shorter scale lengths can be found on any guitar but are usually on smaller bodied guitars. Scale lengths as small as 23” (580mm) can be found – but these are usually found on guitars designed for children and travel guitars. On “normal sized” guitars or I should probably say more common sized guitars, the scale length is usually somewhere between 24” (610mm) and 25.5” (648mm). Try to find something that is on the shorter side of that scale. Classical guitars tend to have scale lengths of 25.5” to 26” which doesn’t make them the easiest to play for those with smaller hands unfortunately. Guitars with a shorter scale length are also easier to play – physically and technically – because there is less tension on the strings. This is particularly good if you are a beginner or struggle with hand issues or hand strength. 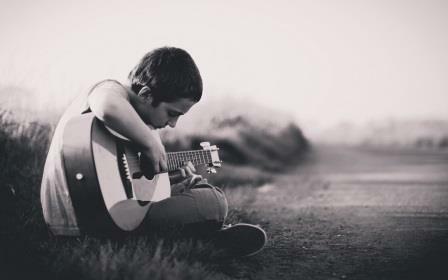 If you have smaller hands, then getting a guitar with a narrower neck width or a slimmer neck profile can make the guitar much easier to play. Neck widths tend to range from around 1.6” (41mm) to 1.85” (47mm). However, widths in that 41mm range are pretty uncommon on acoustic guitars and the widths between 45mm and 47mm are usually reserved for Gypsy Jazz guitars and 12-string guitars. The most common widths on acoustic guitars are 1 11/16 inches (43mm) and 1 ¾ inches (44mm). Getting a guitar with a 1 11/16” (43mm) width might make the guitar a little easier to play or if you can find a model with a smaller width than that. Some necks are more low profile than others. This essentially means that the depth of the neck isn’t as deep. Finding a neck with a narrow/low profile can make the guitar easier to play for those with smaller hands. Another option is to try playing an electric guitar for a while (they tend to have narrower neck widths/lower profile necks). However, I don’t necessarily recommend this if you are wanting to play an acoustic guitar in the long run. I think you are better off searching for an acoustic guitar with a narrower neck width and a lower profile neck. If you already have a guitar and don’t want to buy another one, then lowering the action can help. It can help with any player, smaller hands or not, but is particularly so for those with smaller hands. The action, if you are unfamiliar, refers to how high the strings are from the fretboard. If the strings are quite high, then this is referred to as a high action. If your guitar has a high action, then I highly recommend having it lowered (you can do this yourself but I always think it’s a better idea to have a professional do it). Strings are much easier to press into the frets when they are closer to the fretboard. So if you’re already having to stretch to reach where you want to on the fretboard, then having a high action will make it very difficult to press the string as easily or as accurately as you want to. If you can make your fingers stronger and stretchier, then you won’t have as many problems with fretting and chords, even on guitars with a wide neck and a full scale length. Make sure that you play each note clearly before moving onto the next note. Also, when you play the notes in the subsequent frets your fingers should remain on the other notes and remain there as if you were going to be playing that note clearly. For example when you play the 4th fret of the Low E string with your 4th (pinky finger) your 1st finger should remain on the 1st fret, your second finger on the 2nd fret and your 3rd finger should remain on the 3rd fret. I hope these tips have helped you to find ways to make playing guitar easier and more enjoyable if you have smaller hands. There is no reason that you can’t play as well or better than those with long fingers if you just follow a few simple tips like these. It’s a shame most gypsy jazz guitars have a wide neck. Django Reinhardt is one of my idols, but I doubt I’ll ever get to play the same instruments as him with my small hands. Thanks for the tip on lowering the action. I never thought about that until now, and I’m hoping it’ll help! Yeah it would be nice to find a gypsy jazz guitar with a slightly narrower neck. But I suppose they are wider for a purpose – but doesn’t make it easy for small handed players to play them. Thanks for this post. You talk an interesting topic about the guitar for small handed people, they must know about this. Your first tips are very effective. If you buy shorter scale length guitar you able to solve this problem. Thanks for your input solguitar. There are certainly a few options to make playing guitar easier if you have small hands. Shorter scale length being one of them, of course.